On January 2, the Church commemorates the life and work of Wilhelm Loehe. Although Loehe lived his entire life in Germany, his teaching and mission efforts affected the world. His work was formative in the establishment of many American congregations as well as Concordia Theological Seminary in Fort Wayne. Erika Geiger’s The Life, Work, and Influence of Wilhelm Loehe, 1808–1872, translated from the German by Rev. Wolf Knappe, outlines the impact Loehe had throughout his life. The following excerpt describes Loehe’s meeting with C. F. W. Walther and Friedrich Wyneken (the first and second presidents, respectively, of The Lutheran Church—Missouri Synod) during their trip to Germany. It was agreed that in addition to the seminary for preachers in Fort Wayne a seminary for teachers for the Missouri Synod should be established. Loehe promised to raise the necessary money. However, for the time being he wanted to remain in charge of the Fort Wayne seminary. His experience had been that once he turned over to the Missouri Synod the seminary for preachers and the Franconian colonies, he lost all rights and any possibility of being an influence in his institutions. He would be permitted only to continue to support the Fort Wayne seminary financially and to send seminarians from Germany. Loehe wanted to have things handled in a different way with the seminary for teachers. It opened in the fall of 1852 in Saginaw under the leadership of Georg Grossmann, one of Loehe’s most faithful students. It was not turned over to the Missouri Synod, but for the time being remained directly under Loehe’s supervision. This was an untenable situation for the Missourians, and it caused the final breakup between Loehe and their Synod. Pastor Wyneken wrote to Loehe that the seminary was a sign of mistrust and disunity. Without using many words he asked him to “take the seminary away from Saginaw.” With that, the separation of Loehe and his faithful few from the Missouri Synod became unavoidable. Loehe was deeply hurt and disappointed. These were his students, his colonists who were turning away from him, joining the Missouri Synod. That Synod declared categorically that in any state in America where there were congregations of their Synod, no other Lutheran congregations should be permitted to exist. Whoever adhered to Loehe’s doctrine of the ministry must move to another state.
. Johannes Deinzer, Wilhelm Löhe’s Leben: aus seinem schriftlichen Nachlass zusammengestellt (Gütersloh: C. Bertelsmann, 1901), III, 90.
. Wilhelm Löhe, Gesammelte Werke (Neuendettelsau: Freimund-Verlag, 1951–91), 2:205–206. From The Life, Work, and Influence of Wilhelm Loehe, 1808–1872, pages 134–35; English translation © 2010 Wolf Dietrich Knappe. 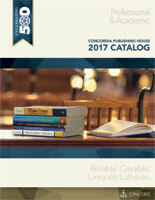 Published by Concordia Publishing House. All rights reserved. To order Wilhelm Loehe, please contact CPH at 800-325-3040 or visit cph.org.